EXPERIENCE SKYWALK: OUR INDOOR ROPES COURSE! 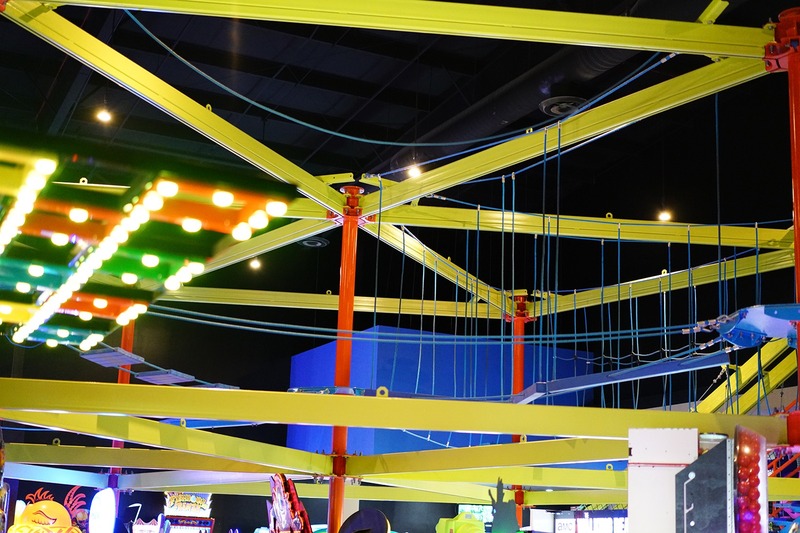 Introducing SKYWALK: an exhilarating, multi-level indoor ropes course. SKYWALK is the thrill of walking a tightrope and the excitement of scaling obstacles. SKYWALK is the rush of crossing rope bridges and the test of balancing on uneven terrain.SKYWALK is an adventure for the whole family! Challenge your friends, family, and co-workers to SKYWALK and enjoy a birds-eye view of our action-packed venue. SKYWALK lets you build confidence, challenge yourself, and have fun in a clean and secure environment that anyone can conquer! CELEBRATE SPECIAL OCCASIONS WITH A SKYWALK ADVENTURE!! Why not make your next birthday, anniversary, or graduation party extra-special by completing our SKYWALK course? SKYWALK is also perfect for corporate team building! Admission to SKYWALK can be purchased separately, or included in any of our all-inclusive packages. To learn more, contact an experienced MaxBowl event planner! Guest safety is a top priority at Max Bowl. SKYWALK was designed and built by a trusted American company that has been making adventure products for more than 25 years. Each participant wears a full-body safety harness attached to a solid steel cable, so there’s no worry of falling. Should you fall, simply step back onto the course and adventure on! Our certified SKYWALK operator carefully checks each safety tether and sling line before participants are allowed onto the course, while our tamper-proof overhead track system prevents participants from removing their safety equipment to protect against accidents. Participant must be 48″ or taller to play without a chaperone. MaxBowl requires all SKYWALK participants to wear secure, closed-toe shoes and comfortable clothing. Pockets must be empty. No loose objects such as cell phones or cameras, eyeglasses should be secure. MaxBowl and employees are not responsible for lost or misplaced personal items. GoPro Cameras must be on a chest harness. Head or handheld harnesses are not permitted. Participants must have pants/shorts and a shirt on. If wearing a dress or skirt you must have shorts underneath. Participant maximum weight is 300lbs. Participant must fit safely in the harness.